the birds are singing and the lawn mower is broken. August is our hottest month of the year. We prefer to stay in the air conditioning, going from air conditioned house to air conditioned car to air conditioned office. We view yard work at an arm's length through the window. But Hans Christian Andersen said, "Just living is not enough...one must have sunshine, freedom and a little flower." We are going to suggest a big flower, the sunflower. According to Greek mythology, a water nymph, Cyltia, was so madly in love with the God of Sun, Apollo, that she never stopped staring up at the sun continuously. But he did not return the love. Taking pity on her, the other Gods turned her into a sunflower that could always follow the path of the sun. Therefore, the sunflower has been following the sun ever since. Sunflowers are the only flowers with "flower" in their name. They are symbols of faith, loyalty and adoration. They are heliotropic, meaning the young sunflowers follow the movement of the sun across the sky, turning their faces 180 degrees from east to west. They reorient at night in anticipation of dawn in the east. Mature sunflowers are stationary and always face east. It is one of the fastest growing plants, requiring only 90 to 100 days from planting to maturity. The scientific name for sunflower is Helianthus. In Greek, Helios means sun and anthos means flower. There are about 70 species and sunflowers are native to North America. A carbon dating test was done on some sunflower seeds found in North American clay, and it was dated back almost 3,000 years. The tallest sunflower was recorded on August 28, 2014 and was grown by Hans-Peter Schiffer in Nordrhein Westfalen, Germany. Guinness recorded it as 30 feet 1 inch tall. Schiffer is a veteran of growing tall sunflowers, as he has held the record twice previously. 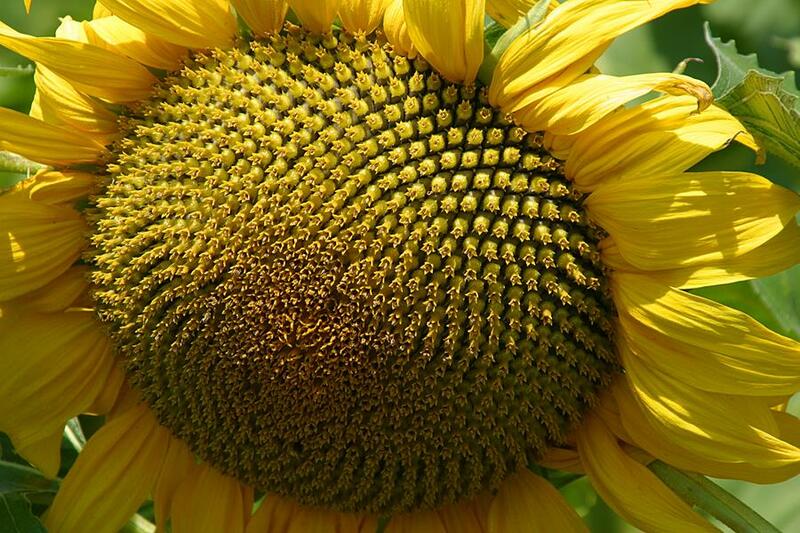 The largest sunflower head on record measured 32 1/4 inches in diameter, measured from the outer tip of the petal on one side to the outer tip of the petal on the opposite side. It was grown by Emily Martin in Maple Ridge, British Columbia, Canada in 1983. The sunflower is the national flower of the Ukraine and the state flower of Kansas. The Ukraine grows the most sunflowers, followed by Russia, and the U.S. is the 11th. producer. The sunflower was an important source of food for the Native Americans. They used yellow pigment from the flowers to paint their bodies during spiritual rituals. They also used the flower for medical purposes and in the production of bread. There was a superstition among Indians that the brave warriors could overcome long distance travel without any food other than a bag of milled sunflower seeds. The greatest medicinal use was for pulmonary afflictions. The Indians used it to treat lung infections, bronchitis, and pleurisy. A concoction was made of the petals which they then consumed. They also placed bowls of sunflower seeds on their dead's graves. The seeds are rich in vitamins and minerals, and are either black or striped. The smaller black seeds produce oil used in cooking, margarine, cosmetics and animal feed. They are the best sunflower seeds for attracting the greatest variety of song birds. The bigger, striped seeds are grown for snacking and as an ingredient in bread and health foods. They are also used for feeding larger bird species such as jays and mourning doves . 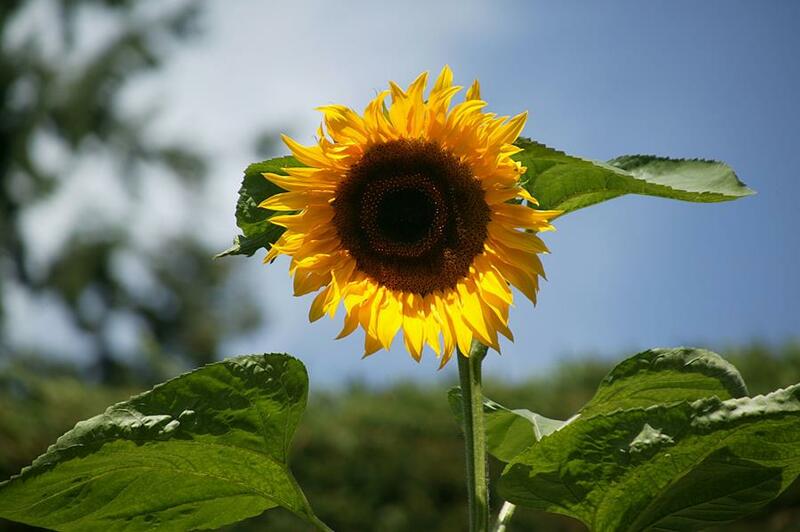 A single sunflower can have up to 2000 seeds. The large petals around the edge of the head are individual ray flowers which do not develop into seeds. These petals are usually yellow, orange or red in color. Some heads have striped petals. The dried stems can be used for fuel and composted for fertilization. The Chinese have used the fiber from the stems for fabrics and paper. The pith, the interior of the stalk, is one of the lightest substances known and is used in the scientific labs. The beauty of sunflowers was a great inspiration for the Dutch painter Vincent Van Gogh, who painted two series of paintings dedicated to sunflowers, one while in Paris and another in Aries in southwestern France. "Sunflower", the fourth version with a yellow background and painted in Aries, is one of the most popular paintings in the National Gallery in London. It was painted in 1888, during a rare period of optimism. It is the painting that is most often reproduced on cards, posters, stationary, etc. It is also the picture that Van Gogh was most proud of. The Yasada Insurance Company in Japan paid over $39 million in 1987 for another version of this painting that was done in 1889, also in Aries. Van Gogh said, "The sunflower is mine, in a way" and "I find comfort in contemplating sunflowers". Indeed, sunflowers are associated with Van Gogh. daily year round and receive over a million visitors each year. It is a designated National Historic Site of Canada. Sunflower II was captured in the New Orleans Botanical Gardens located in The City Park, New Orleans, Louisiana. It was unveiled in 1936 as the first classical garden in New Orleans with funding from the WPA(Works Progress Administration), a federal agency created as a Great Depression relief program. When the WPA's funding dried up, the garden's upkeep became lagging, vandalism was common and attendance was down. In the 1980's The Friends of City Park was founded and the gardens were renovated. Growth continued in the 90's only to be severely destroyed by Katrina in 2005. Three feet of water remained for about two weeks, killing nearly 90% of the plant life in the gardens. The gardens reopened on March 2006, just nearly half a year after the storm. Due to the combined efforts of many, few costs to the visitor have been made, except for a dollar rise in the admission price..